This morning we were out early. I needed more milk for the fridge and strong flour for breadmaking. On the way to the Supermarket I noticed some wild garlic nestled in between some shrubby and flowering daffodils. There isn’t so much growing there this year as last year somebody ripped almost the full amount up. I took only what I needed from 1 plant, even though there was more than one there. I didn’t take more than 1/3 to allow it to flourish again. There were some buds and I know more will flower over the coming weeks so I can take a little more in a few days time. The 3 year old was fascinated with these beautiful delicate flowers that smelt of one of his favourite foods and clenched a stem tightly in his fist until we got home. He, and the whole house is now filled with the heady scent of garlic. When washed and chopped the wild garlic will maybe amount to 2 tablespoons which is the ideal amount for a garlic butter but it seems like a waste to put the beautiful flowers into the butter. It was nearly time for elevenses anyway so I cut 3 chives from my bush by the front door which has really sprouted in the past fortnight. I put on some water to boil and soft poached an egg. I had some rocket left over from a market I was at during the week, it keeps very well in the fridge. A sprinkling of chives, garlic flowers and a runny, soft egg over the top as a dressing. The warm egg on top of the herbs increased the smell in the room and I barely paused to take a photograph before I devoured it all. 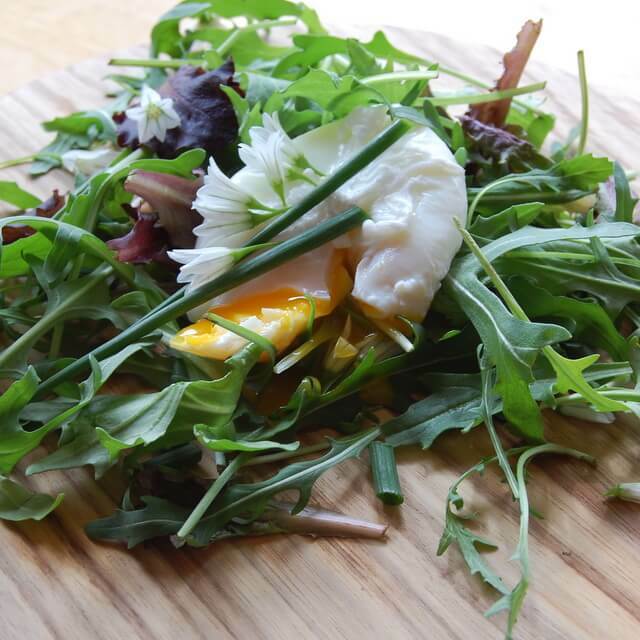 The runny egg yolk serves as a dressing and there is no need to season with pepper due to the amount of rocket in the salad. Add salt if you wish. This is real, fast, food. It took just 3 minutes to poach the egg. In the time the egg was poaching I had assembled the rest of the salad. If you manage to find some fresh wild garlic make the most of it, it is a real treat. Looks delicious…. I bet it tasted delicious too! Simple, wholesome, tasy & fast! What more could you want. Looks delicious. Looks really gorgeous C 🙂 I know where there is a patch and it’s really a good one, but it’s on a dangerous bend on a side road! No wonder it flourishes. Lovely pics too. Actually Siobhán it was you doing it put me in mind to do it. 😉 Wild garlic by the roadside is the exact place you will find it or in a shady spot in a local park. It’s one of the great foraging foods.